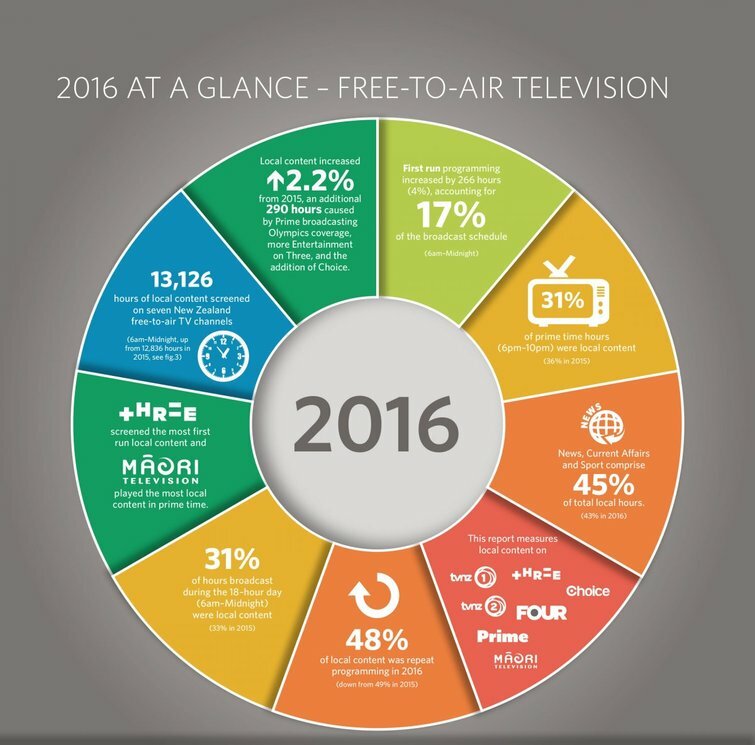 Since 1989 NZ On Air has measured local free-to-air television content. This report compares the schedules of seven national free-to-air channels, to observe trends and changes in the local content landscape. In 2016 local content overall was up 2.2%. There was a 4% increase in first run content (new) but a drop in the amount of local programming in prime time. Each year NZ On Air invests around $80 million in free-to-air television programmes supporting up to 1,000 hours of new local content. This report is an important way we monitor the amount of total local content on television, including content we don't fund. *All figures in the report are based on an 18-hour broadcast day, 6am to midnight. Source data is provided by Nielsen. The Local Content Report looks at the amount of locally produced content by genre on seven free-to-air channels. Since the report began in 1989 local content has increased 468%. First run local content (new) was up by 4%, or 266 hours more than 2015. This was partly due to Olympic Games coverage on Prime and new investment by MediaWorks. Local content comprised 31% of prime time schedules (down from 36% in 2015). The biggest increase in any genre was Entertainment programming which was up 42%, largely influenced by new nightly programme Family Feud on Three. Documentary, Drama/Comedy, Sports and Māori programming for a general audience all increased, while General Factual and Children’s programming were down. Repeat programming was down 1%. NZ On Air accounts for a relatively small portion of local content overall because the agency does not invest in the high volume genres of Sports, News and most Current Affairs. These genre account for 45% of the local content in TV schedules. In 2016 NZ On Air funded content was 15% of all local content, up 1% from 2015.